How are you? It was so good to hear from you and it sounds like you have such an interesting life! Today I want to tell you about my greatest strengths. I think it is really hard to identify your own strengths so I decided to ask some of my friends for their opinions. They told me that I am compassionate, outgoing, and hard-working. I am compassionate because I care so much about other people. I hope that someday, my work involves other people because I can't imagine not interacting with and helping others on a daily basis. I have a solid group of friends who I care about so much, and I am always willing to listen and give advice. I am outgoing because, like I said, I love being around other people. Sometimes I worry that I talk TOO much! I love to meet new people and to keep in touch with friends using the Internet or phone. I rarely get nervous in groups of people, and really value all of the people I have had the pleasure of being around in my life, especially here at Boston College! I am hard-working, meaning that I always give my best when doing school work. I always worked very hard in high school, too, and that is how I got into a good school like BC. College is pretty difficult; we have a lot of reading to do and papers to write, and it takes a lot of time to complete everything. Luckily, I am pretty good at managing my time so I do not stress out over all the homework! Having these strengths has helped me both in school and in my social life, and I value these character traits. 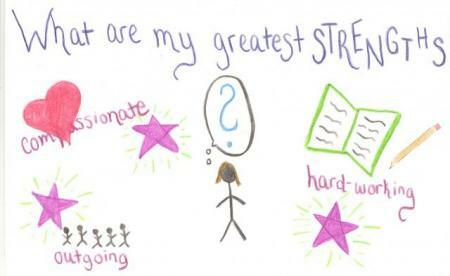 What are your greatest strengths? What do people think of when they think about you?